Here’s my first book review ever, the first of, I hope, many more! 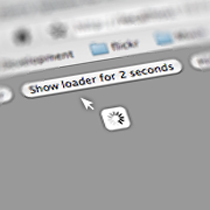 First of all I must say that I’ve been quite late and lazy on getting around all the new feature of jQuery 1.4+. Sure I was all excited to hear about the new stuff, but didn’t really into it deeper than the method names. I must say this book arrived in time for me as it allowed me to get deeper understanding of all the new methods. Well…it’s a reference guide. 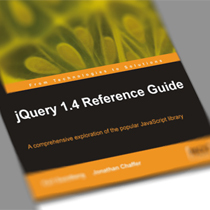 It’s a book containing all the jQuery methods of version 1.4, see it as the paper version of the jQuery documentation. It contains all the methods, I didn’t notice any missing. It also dissect all of them by explaining their purpose, the parameters they accepts, what they return or what they do. Every method is also completed by a nice working example so you can get an idea of what it look like used in a real project. It is NOT a book for someone who thinks it’ll contain tutorials and example of small working scripts. All it does is describe all the methods, gives you example on how to use them and it ends there. There’s at the beginning of the book a dissection of a “typical” jQuery script explaining how everything ties together. It’s well explained and well presented but it’s not significant enough for someone to consider the buying the book upon that single chapter. There are other books that do a far better job at dissecting and giving you practical example. Well who is it for then? Well, I’d say this book is aimed at intermediate/advanced jQuery developer. It’s a book for someone who wants to know all the possibilities jQuery offers you. As I said before, this book cover all the method, it won’t tell you: “You want to call something upon every ajax calls you make in your application, well here’s how”, instead it’ll explain the .ajaxStart() method and it’ll be your job to figure out how to use it and when to use it. That’s specifically why I think it’s aimed more toward intermediate/advanced developers, those who need a “paper jQuery API bible” more than a beginner that needs to be taken by hand and explained all the possibilites. It’s your job to figure out the possibilites based on what you’ll find in the book. Depending on your skill level, I think it’s a nice addition to the jQuery documentation found online. I personally went through it during transit while I had no access to a computer and it allowed me to discover methods I wouldn’t have noticed by browsing the jQuery doc. Hier können Sie einfach WhatsApp-Konto ohne Download oder Umfrage hacken, nur in wenigen Klicks können Sie Ihre Ergebnisse auch erhalten. If you get the effective points of the changing ringtone tutorial for windows mobile then guys you can done it easily all time and after learn about it my friends you have no need for it every time but fires of all you have to know about it and also understand the concept of the windows mobile ringtone settings. 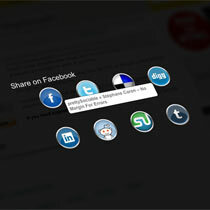 Thanks for sharing amazing post here.keep posting more interesting articles with more interesting updates. Really such a great post dear. At the end of the day, this methodology would be an entire misuse of government assets. It would be immensely less expensive and more successful if employees were required to penetrate such specialist co-ops, shared the information among one another and those understudies got would be rebuffed freely and extremely. This would create dread of being discovered utilizing such an administration. Get windows 10 tutorial from here within minute. Thank you so much for sharing this precious information as it helped me gain some serious knowledge about “Book Review” With the help of your write-up, I am able to understand the basics of the given article. I plan to work on this further and I will definitely work towards getting more information on the same topic with your guidelines. A book review is a description, critical analysis, and an assessment on the quality, meaning, and implication of a book, Assignment Help UK Online available at cheap rates. I wanted to inform you that you have people like me who appreciate your work. Definitely a great post I would like to read this.